Our interactive and enjoyable Paediatric First Aid training course meets the requirements of the Early Years foundation stage statutory framework as well as Ofsted requirements. It can also be used as evidence for employees working towards an NVQ in Childcare and Education. We can organise for one of our experienced trainers to visit your venue to carry out The Paediatric First Aid training course. The Paediatric First Aid training course is for those working with children up to eight years old. This course focuses on first aid incidents that are commonly faced by teachers, childminders, au pairs, playgroup leaders and others working in a nursery, daycare or home setting. For the Paediatric First Aid training course we take a maximum of 12 candidates per course (extra trainers can be booked if required for larger groups). The Paediatric First Aid training course consists of 12 hours of training usually split over two days. This course is available for schools at a discounted price from £697 for up to 12 candidates. The Paediatric First Aid training course is interactive and fun and is taught in a very hands-on manner. 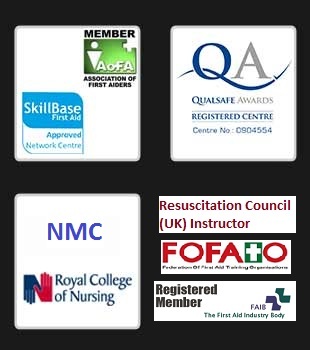 It equips you with the skills to be able to recognise and respond to a first aid emergency in a safe and efficient manner. Your staff will be trained not only in how to treat an injury but also how to prevent common accidents occurring and the knowledge of what type of injuries are common with each age group. This course is certified on the basis of continuous assessment by the trainer. The course content meets Ofsted requirements and includes the cost of manuals and certificates (valid for three years).